Secure, cloud-based technology insures that your information is safe and always available. Update your profile as your career progresses so you’re ready for any opportunity. 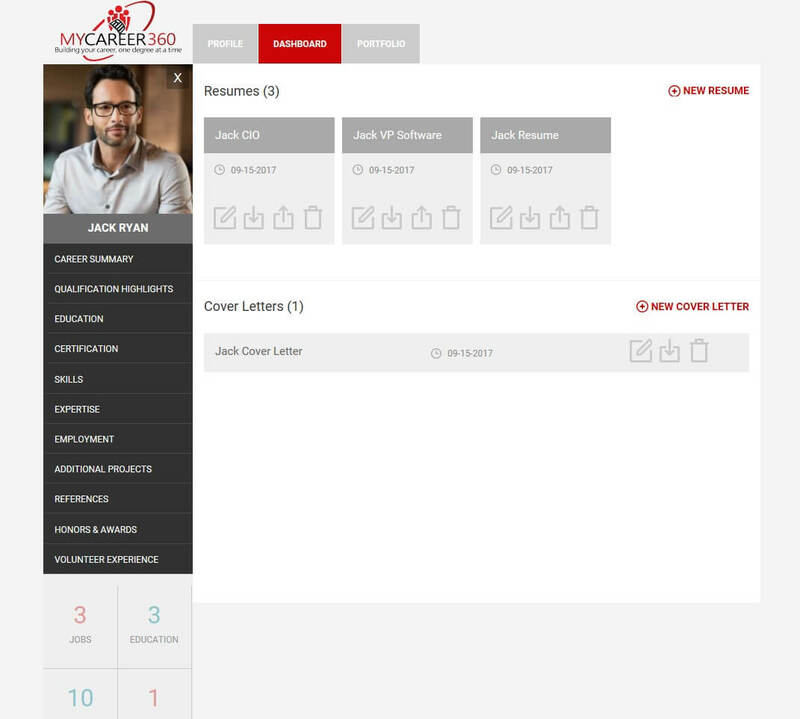 Dynamic Resume Builder allows you to create and save multiple versions of your resume and accomplishments to target a specific job or opportunity. 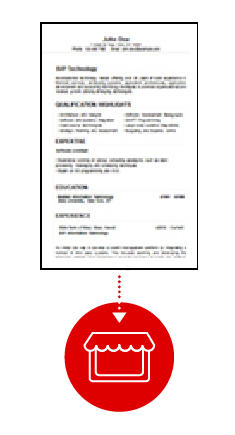 Choose a template from one of the many available resume templates. 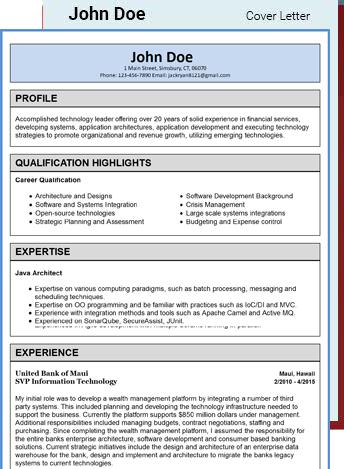 Create impactful resumes showcasing your strengths. 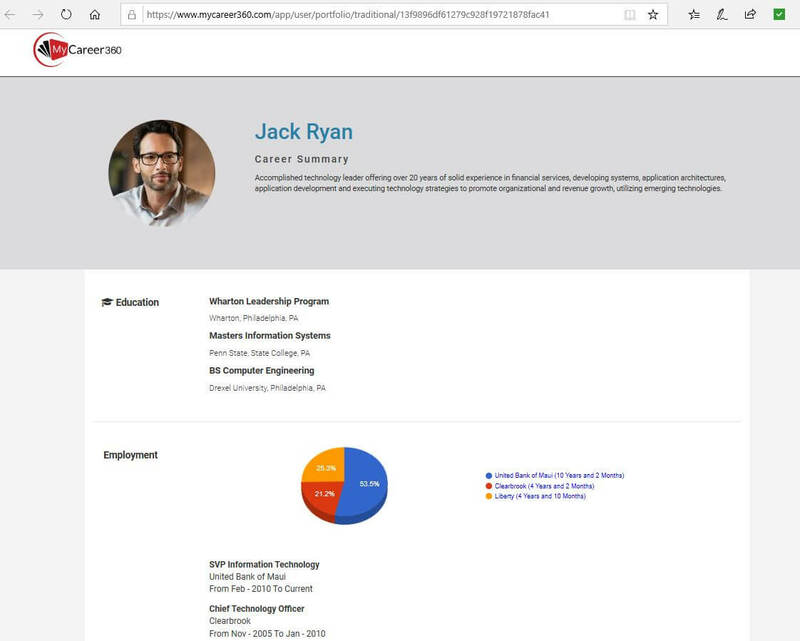 Customize your career portfolio page and share the link with a prospective employer or reference. Intuitive career analytics dashboard so you can monitor your marketability. Step 1: Build Your Profile. 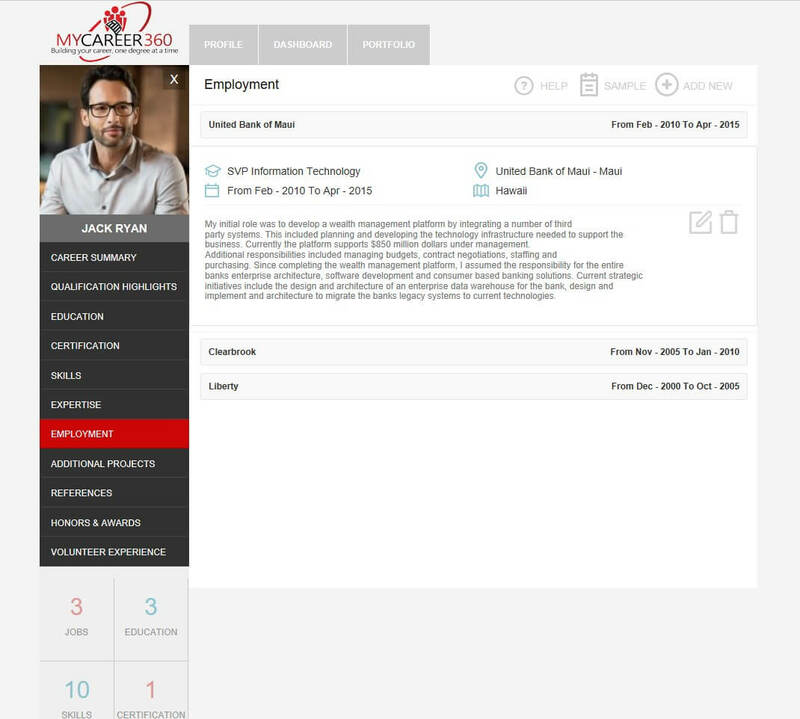 Enter your education, qualifications and employment history into your MyCareer360 profile and customize and save multiple versions to target a specific job or opportunity. Access your cloud-based profile anywhere, anytime to stay up-to-date. Step 2: Select your Resume Content. 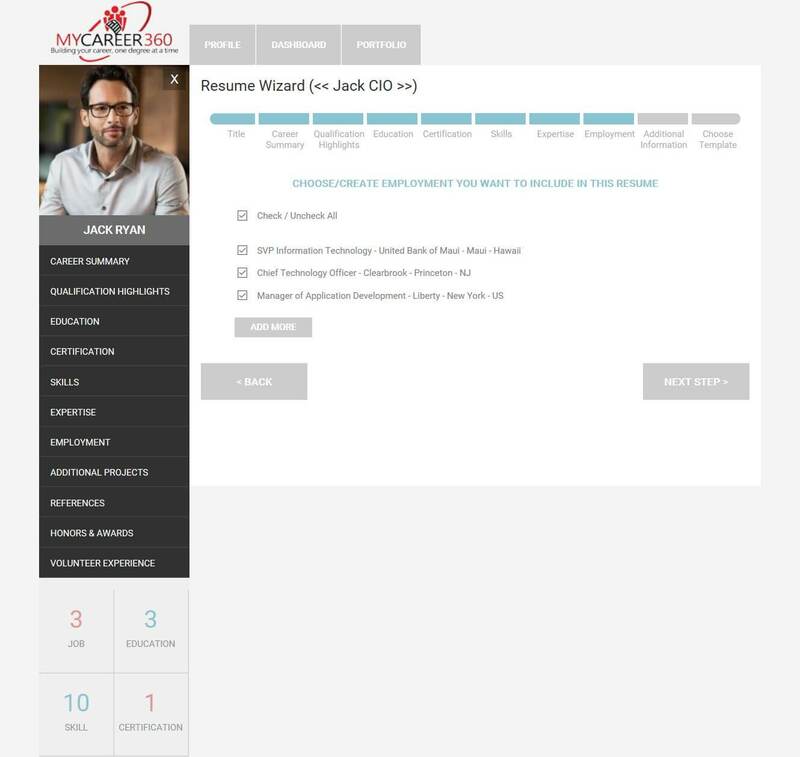 Use the resume wizard to select the content you want to include on your resume. 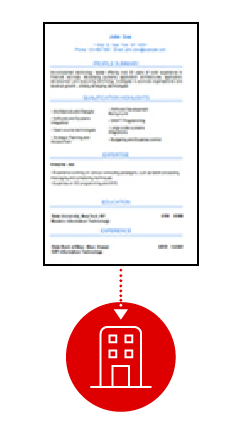 Remember you can always create and save multiple versions of your resume! Step 3: Select a Template. Choose from several clean and beautiful professional templates so your resume stands out from the crowd. Step 4: Save your Resume. One-size-fits-all does not apply to resumes. Create multiple versions of your resume so you can spotlight the skills that make you the right fit for the job. Step 5: Apply. 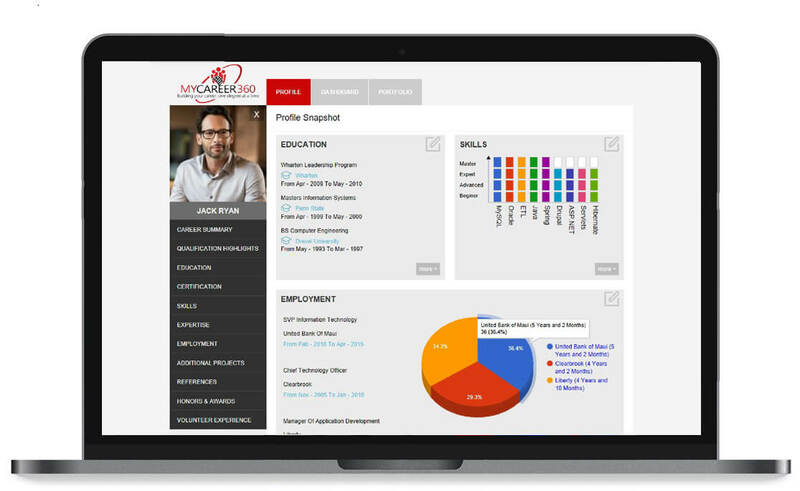 Customize and maintain your career portfolio online. Wow hiring managers with an online portfolio showcasing your skills that brings your accomplishments to life. Share your resume and portfolio link with prospective employers. 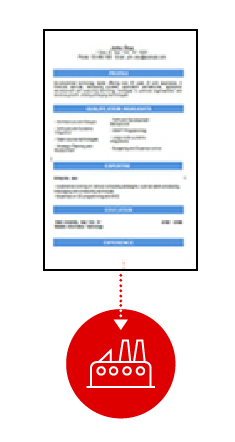 Track where you're sending your resumes using the resume submissions log. Step 6: Stay up-to date. Continue to add your qualifications and skills to your online profile as your career progresses. Monitor your progress using the career analytics dashboard. Check out MyCareer360 blog for tips on how to write a professional resume. Get started with a free 30-day trial. Don't lose your chance to boost your career!